Are you in need of a new set of wire strippers? You’re in luck because we’ve got a round-up of the best wire strippers available. Whether you’re buying your first set of electrician tools or you need to replace a worn-out stripper for home repairs, chances are one of these tools will be right for you. In this guide we’ve covered wire stripping basics, like how they work and what to look for when buying, as well as reviewed TOP 5 best wire strippers along with their differentiating features. Wire stripping is a task that prepares the end of a wire for a splice or a connection to another electrical component. A wire stripper is a must-have tool for anyone who performs wiring work because they make the job of cutting wires and stripping them faster and avoid damaging the metal wire that’s under the insulation. The term “wire stripper” refers to a type of hand tool used by production workers and electricians to assemble and repair wiring. The main purpose of wire strippers is to make it simple to remove the plastic insulation from the end of a cut piece of electrical wire. This is necessary to connect the wire to a terminal or to splice two wires together. Many wire strippers will also cut wire, so you don’t need to switch between tools when cutting and stripping numerous lengths of wire at a time. Automatic wire strippers make the stripping task quicker by pulling the insulation off the wire as well as cutting it. Manual strippers require you to pull the wire out after the insulation is cut, which can get tiresome if you need to prepare a large number of wires for a project. Wire Strippers Buying Guide - What to Look for When Buying? These may seem like simple, standardized hand tools, but there’s actually a few important features that sets one wire stripper apart from another. Some are designed to do repetitive stripping fast, and others are intended for repair work that requires care and versatility. Below are the key features to think about when shopping for a modern set of wire strippers. Automatic vs. manual: This is a major distinction between wire strippers. Automatic strippers are designed to cut the insulation and pull it away in a single step. Manual strippers take more time and effort because you’ll need to yank it off the wire with your other hand. The downside of automatic strippers is that they often break smaller gauge wires, so manual strippers are better for delicate wiring work. Wire gauges: Smaller wire strippers will have notches for the most common wire gauges, while larger strippers will handle the less common sizes, too. Make sure to compare the gauges a pair of strippers can fit to the wire sizes you know you’ll be cutting. Durability: Check customer reviews and look at the material that a wire stripper is made of before making a purchase. If you’ll put them to daily use, you’ll want a pair that’ll last. Handle grip: A comfortable grip is important if you’ll be using the wire strippers for long periods of time. A poor grip can lead to blisters and cramps by the end of the day. Needle-nose tip: If you need to guide cut wires through conduit or bend them onto terminals, it can be less of a hassle if the strippers have a needle nose plier tip to grip them with. It’ll save you the time spent switch between tools. Crimping: If you usually crimp terminals onto wires after stripping, it’ll be convenient to get a stripper with crimping slots. Irwin Tools makes a full line of wire stripping, cutting, and crimping tools that range from do-it-all multipurpose tools to simple tools that can handle a single task. The 6-inch Wire Stripper by Irwin is the simplest wire stripper they offer. It features manual wire stripping for electrical wire gauges between 10 and 24 AWG. he handle grip is designed to reduce hand fatigue when you’ve got dozens of wires to cut and strip, and the texture used makes these strippers unlikely to slip out of your hands. They also have a spring that snaps them open after each stripping, and a lock can be set to hold them closed. Another stripping tool made by Irwin Tools is their 8-inch Self-Adjusting Wire Stripper. This tool uses a self-adjusting mechanism to strip away up to two inches of insulation with each squeeze of its handle grips. You can control the amount of insulation it removes with an adjustable stopper, and a swivel knob lets you make small adjustments when stripping wires smaller than 20 AWG. It strips 10 to 24-gauge wires without any extra adjustments, and it has a crimper that fits 10-22 AWG wires, both insulated or non-insulated. You can even use it to crimp ignition terminals between 7 and 9mm in size. This tool features the same ProTouch grip design as Irwin’s 6-inch stripper, and it makes life easier when you’re working long hours. Overall, this is a good choice when you need to strip cut wire ends as quickly as possible. Klein Tools’ 11055 Wire Cutter and Stripper strips solid 10 to 18 AWG wires and 12 to 20 AWG stranded wires. It’s designed with larger gauge wire handling in mind, featuring a large flat surface you can use to twist up to three wires at a time for terminal posts or splicing. Klein also added a screw shearer to the tool that can break off 6-32 or 8-32-sized screws. The tip is designed for a solid grip, making it possible to use as a pair of pliers. The grip is made of a soft, comfortable material that saves your hands from the fatigue of working continuously. The grip is also held open with a spring to make changing wires quicker. It’s a good choice if you need to cut, strip, and twist heavier gauge wire. Klein’s 11063W model is an automatic wire stripper that can remove up to an inch of insulation with a single motion. This stripper is designed to both cut and strip 8 to 20 AWG-sized solid wire and stranded wires between 10 and 22 AWG. It’s able to strip smaller gauge wire with a minimum of damage because of the precision-machined stripper holes. It also uses a tension loader than doesn’t need to clamp the wire with excessive force, which also helps avoid breaking wires. The grip is spring-loaded and designed for long-term use. The chassis has a heavy-duty design that includes an Ecoat corrosion-resistant finish. Kinee’s Adjustable Automatic Cable Wire Stripper is marketed as an automotive wiring tool that saves time when wiring sound systems. It’s designed to strip insulation from solid wires ranging from 10 to 24 AWG, and it excels at the task with wire sizes typically used for stereo speakers. It has a cutting blade on the nose to quickly snip wires before stripping them. The depth of the stripping action can be adjusted using a sliding piece in the tool’s lower jaw. The construction of this tool leaves something to be desired. Being made of plastic, it’ll be more susceptible to breaking than other cast steel tools, and the lack of a soft grip will be an issue if you use the tool for more than a few minutes. Can wire strippers be used to cut guitar strings? You may be able to do this with larger wire strippers, but it’s not recommended to cut wires made of metals harder than copper. You could damage the stripper’s cutter attempting to cut steel cable, for example. Check with the manufacturer’s advice before cutting anything other than electrical wire. Can wire strippers crimp terminal connectors onto wires? Many have this capability. Check the wire stripper’s specifications. Some have slots for crimping wires with or without insulation on them. Can I use wire strippers to cut coaxial or ethernet cables? Coaxial and ethernet cables need special tools to be stripped properly. This is because they have multiple wires twisted together inside the insulation that electrical wire strippers are likely to damage. Some automatic strippers allow you to adjust the cutting blade height and the clamping strength to handle delicate wires that break easily. Many other automatic strippers, however, adjust themselves to the gauge wire you place in them automatically and lack these manual adjustments. If you need these features, be sure to check a stripper’s specifications closely. Can you strip Teflon-coated or wet wires with these wire strippers? The insulation on those wires requires special strippers. Normal wire strippers are designed with plastic insulation in mind, which is thicker and provides more traction. If you work with a wide range of unusual wire gauges, select two or three wire strippers to cover all of them. If you find yourself cutting, stripping, crimping, and bending wires around terminal posts, invest in a combo tool that can do all these tasks. 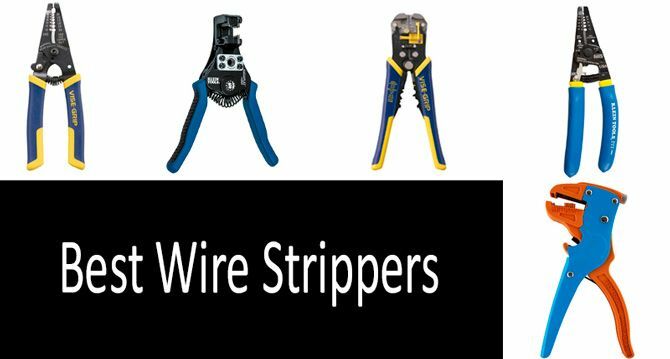 That wraps up our run-down of the TOP 5 wire strippers on the market in 2018. There’s something for most wire-stripping tasks in our reviews this year, whether you need a handy manual stripper, a solid automatic stripper, or you just need something to make rewiring your car’s sound system easier. We expect the tool industry to keep finding new ways to make wire-stripping easier, so be sure to check in for our next installment. Until then, we hope we’ve made shopping for your next wire stripper simpler.